Lock, document, and policy boxes provide security and can be customized to reflect your company's image. American's lock, document, and policy boxes could be the key to helping you promote security to all of your clients. Our boxes will allow your clients to store all of their documents or policy information in one place, ensuring that they stay organized and that you will never have to replace lost documents. Policy boxes have helped companies strengthen relationships with their clients since they were first manufactured in 1936. Our boxes will provide security and goodwill whenever you have to deliver policies to valued customers. They are also suitable as presentation boxes, or as giveaways for insurance companies. American's boxes are easily tailored to fit your custom needs. The codes for our three-wheel custom locks are set by the individual user, allowing them to be changed at any time to maintain security. You can also add a personal touch to your lock, document and policy boxes with a personalized nameplate or silk-screened logo. Our boxes also include an internal business card holder. 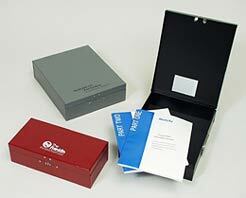 For more information, see the product description for our lock, document and policy boxes.